This Noritake Art Deco muffineer set is the standard shape but with a spectacular design of a black background chevron or spear shape coming up from the lower part of each piece. Highly enameled abstract blossoms fill the purple outlined space. 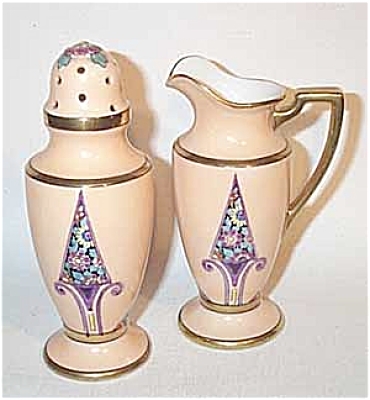 The body of each piece is a salmon pink color which is unusual for Noritake. Gold trim on rims and shoulder of each piece. Excellent condition. Red wreath mark.